Question: And after defining the MVP in the Lean Inception? When do you continue defining the next “Whats”? In the refining meetings? Answer: on the Lean inception you typically have more clarity on the MVP, and a high-level view on the product vision. As soon as you get real feedback from the MVP, you better act on it. 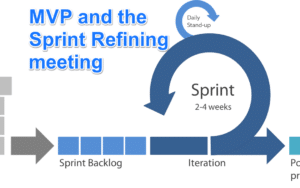 The Sprint Refining meeting is a great forum to make sure the next set of work items are (1) aligned with the product strategy and vision (maybe this was originally aligned/defined on the lean Inception) and (2) take into consideration the feedback and learning from the MVP. From Lean Startup, as you deliver your MVP, you should schedule a meeting – MVP data analysis – to look at the data from the MVP real usage. For example, you deliver MVP on Jan 1st and consider 12 days is enough to gather data on the MVP usage, then you should pre-schedule a MVP data analysis meeting for Jan 13th. Please note the different intention between these two meetings. MVP data analysis meeting is to check the MVP numbers, seek some learning and validate your business hypothesis. The Scrum refining meeting is adhering the work to be done to the product and business goal. Paulo Caroli is the author of “Lean Inception: How to Align People and Build the Right Product” (the first on a series of books about Lean Strategy). He's also the creator of FunRetrospectives.com , a site and book about retrospectives, futurospectives and team building activities.